These cozy rooms feature a stylish modern decor. Sleep comfortably, and feel rejuvenated and ready to head out to enjoy the amazing attractions that the hotel and the city have to offer. 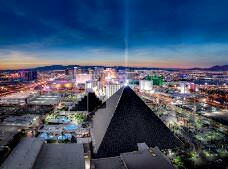 Make your Las Vegas vacation an unforgettable experience! These stylish and beautifully furnished guestrooms feature high-speed wireless Internet along with cable TV, room service and an alarm clock. These charming 449 ft² rooms are stylishly decorated and feature convenient amenities and luxurious furnishings along with accent lighting and lovely artwork. In these minimalist style guestrooms you’ll find excellent services and amenities, such as air conditioning, a 50” flat-screen television, plenty of storage space, a work area, media center and Wi-Fi (fees apply). Enjoy incredible views through floor-to-ceiling windows during your stay in this spacious and lovely suite. Each suite has a separate living room and bedroom along with a full bathroom with a dual vanity. Guests can also take advantage of a mini-fridge, a wet bar and a convenient work desk. Live like royalty in this newly renovated 590 ft² suite. This Pyramid suite features a soaking tub with a view, an adjoining sitting room and two spacious beds to unwind.